For the British naïve painter, see Gladys Cooper (artist). 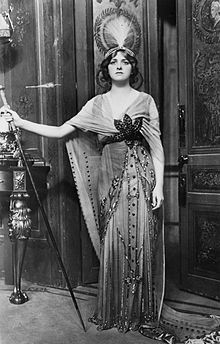 Dame Gladys Constance Cooper, DBE (18 December 1888 – 17 November 1971) was an English actress whose career spanned seven decades on stage, in films and on television. Beginning as a teenager in Edwardian musical comedy and pantomime, she was starring in dramatic roles and silent films before the First World War. She also became a manager of the Playhouse Theatre from 1917 to 1933, where she played many roles. From the early 1920s, Cooper was winning praise in plays by W. Somerset Maugham and others. In the 1930s, she was starring steadily both in the West End and on Broadway. Moving to Hollywood in 1940, Cooper found success in a variety of character roles; she was nominated for three Academy Awards, the last one as Mrs. Higgins in My Fair Lady (1964). Throughout the 1950s and 1960s, she mixed her stage and film careers, continuing to star on stage until her last year. Cooper was born at 23 Ennersdale Road, Hither Green, Lewisham, London, the eldest of the three daughters of Charles William Frederick Cooper (1844–1939) by his marriage to Mabel Barnett (1861–1944). Her two younger sisters were Doris Mabel (1891–1987) and Grace Muriel (1893–1982). 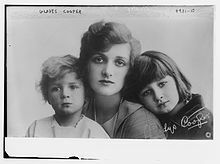 Gladys Cooper spent most of her childhood in Chiswick, where her family moved when she was an infant. She made her stage debut in 1905 touring with Seymour Hicks in his musical Bluebell in Fairyland. The young beauty was also a popular photographic model. 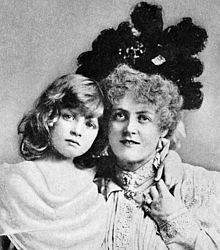 In 1906, she appeared as Lady Swan in London in The Belle of Mayfair and then in the pantomime Babes in the Wood as Mavis. The following year she became a chorus girl at the Gaiety Theatre, creating the small role of Eva in The Girls of Gottenberg. That Christmas, she was Molly in Babes in the Wood. In 1908, she appeared in the musical Havana followed, the next year, by Our Miss Gibbs, in which she played Lady Connie; she was then on tour again with Hicks, in Papa's Wife, before playing Sadie von Tromp in the hit operetta The Dollar Princess at Daly's Theatre in 1909. In 1911, she appeared in a production of The Importance of Being Earnest and in Man and Superman. Among several other plays, the next year she was Muriel Pym in Milestones at the Royalty Theatre. A highlight of 1913 was Dora in Diplomacy at Wyndham's Theatre. That year she also played the title role in The Pursuit of Pamela at the Royalty. In 1913 Cooper appeared in her first film, The Eleventh Commandment, going on to make several more silent films during the First World War and shortly afterwards. She continued full-time stage work, however, including appearances as Lady Agatha Lazenby in The Admirable Crichton in 1916 and Clara de Foenix in Trelawny of the Wells. In addition, in 1917, Cooper became co-manager, with Frank Curzon, of the Playhouse Theatre, taking over sole control from 1927 until she left in 1933. During these years, she starred several times in My Lady's Dress. She appeared in W. Somerset Maugham's Home and Beauty in 1919, repeated Dora at His Majesty's Theatre in 1920 and elsewhere thereafter, and played numerous roles at the Playhouse Theatre. It was not until 1922, however, now in her mid thirties, that she found major critical success, in Arthur Wing Pinero's The Second Mrs. Tanqueray. Early in her stage career, she was criticised for being too stiff. Aldous Huxley dismissed her performance in Home and Beauty, writing "she is too impassive, too statuesque, playing all the time as if she were Galatea, newly unpetrified and still unused to the ways of the living world." Evidently, her acting improved during this period, as Maugham praised her for "turning herself from an indifferent actress to an extremely competent one" through her common sense and industriousness. For both the 1923 and 1924 Christmas shows at the Adelphi Theatre, Cooper played the title character in Peter Pan, while also playing several other roles at that theatre during those two years. She appeared in Maugham's The Letter in London and on tour in 1927 and 1928, in Excelsior (adapted from "L'Ecole des Cocottes" by H.M. Harwood) in 1928, and in Maugham's The Sacred Flame in 1929, also in London and on tour. Among other roles, Cooper was Clemency Warlock in Cynara (1930), Wanda Heriot in The Pelican (1931), Lucy Haydon in Dr Pygmalion (1932), Carola in The Firebird (1932), Jane Claydon in The Rats of Norway (1933), Mariella Linden in The Shining Hour in 1934 and 1935, in London and New York City and on tour (at the same time making her first "talkie" film, The Iron Duke), also playing Desdemona and Lady Macbeth on Broadway in 1935. She was Dorothy Hilton in Call it a Day, again in both London and New York, from 1935 to 1936. A highlight of 1937 was Laura Lorimer in Goodbye to Yesterday in London and on tour. In 1938, she played Tiny Fox-Collier in Spring Meeting in New York, Montreal and Britain, as well as several Shakespeare roles and Fran Dodsworth in Dodsworth. She repeated Spring Meeting in 1939.
Cooper turned to film full-time in 1940, finding success in Hollywood in a variety of character roles and was frequently cast as a disapproving, aristocratic society woman, although she sometimes played lively, approachable types, as she did in Rebecca (1940). She was nominated three times for an Academy Award for Best Supporting Actress for her performances as Bette Davis's domineering mother in Now, Voyager (1942), a sceptical nun in The Song of Bernadette (1943), and Rex Harrison's mother, Mrs. Higgins, in My Fair Lady (1964). In 1945, after playing the role of Clarissa Scott in the film The Valley of Decision, for Metro-Goldwyn-Mayer she was given a contract with the studio. Her credits there included both dramatic and comedy films, including The Green Years (1946), The Cockeyed Miracle (1946) and The Secret Garden (1949). Other notable film roles were The Man Who Loved Redheads (1955), Separate Tables (1958) and The Happiest Millionaire (1967) as Aunt Mary Drexel, singing "There Are Those". Her only stage roles in the 1940s were Mrs. Parrilow in The Morning Star in Philadelphia and New York (1942) and Melanie Aspen in The Indifferent Shepherd in Britain (1948). She returned to theatre (between films) more often in the 1950s and 1960s, playing in London and on tour in such roles as Edith Fenton in The Hat Trick (1950); Felicity, Countess of Marshwood, in Relative Values (1951 and 1953); Grace Smith in A Question of Fact (1953); Lady Yarmouth in The Night of the Ball (1954); Mrs. St. Maugham in The Chalk Garden (1955–56), Dame Mildred in The Bright One (1958); Mrs. Vincent in Look on Tempests (1960); Mrs. Gantry (Bobby) in The Bird of Time (1961); Mrs. Moore in a stage adaptation of A Passage to India (1962); Mrs Tabret in The Sacred Flame (1966 and 1967); Prue Salter in Let's All Go Down the Strand (1967); Emma Littlewood in Out of the Question (1968); Lydia in His, Hers and Theirs (1969); and others. She received two nominations for the Tony Award for Best Actress in a Play, for her roles in The Chalk Garden and A Passage to India. She also had various television roles in the 1950s and '60s. These included, among others, three episodes of The Twilight Zone. In the first, titled "Nothing in the Dark" (1962), she played an old lady who refuses to leave her flat for fear of meeting 'Death'. A young policeman (Robert Redford) is shot at her doorstep and persuades her to let him inside. Her second appearance was in "Passage on the Lady Anne", which aired on 9 May 1963. Her final episode was the 1964 "Night Call", where she portrayed a difficult, lonely old lady who is besieged by late-night phone calls. Cooper starred in the 1964–65 series The Rogues with David Niven, Charles Boyer, Gig Young, Robert Coote, John Williams and Larry Hagman. 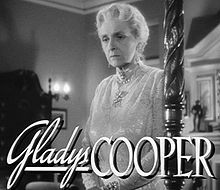 The series lasted a single season of thirty episodes, most of which featured Cooper as the matriarch of a crime family. In 1967, at the age of 79, she was appointed a Dame Commander of the Order of the British Empire (DBE). Her last major success on the stage was at age 82, in 1970–71 in the role of Mrs. St. Maugham in Enid Bagnold's The Chalk Garden, a role she had created on Broadway and in the West End in 1955–56. Cooper was married three times. Captain Herbert Buckmaster (1908–1921). The couple had two children: Joan (1910–2005), who was married to the actor Robert Morley, and John Rodney (1915–83). Sir Neville Pearson (1927–36). Sir Neville and Lady Pearson had one daughter, Sally Pearson, aka Sally Cooper, who was married (1961–86) to actor Robert Hardy. Philip Merivale (1937–1946), a fellow actor. The couple lived for many years in Santa Monica, California as permanent resident aliens. He died at age 59 from a heart ailment. Her stepson from this marriage was John Merivale. She lived mostly in England in her final years and died from pneumonia at the age of 82 in Henley-on-Thames, Oxfordshire. ^ "Gladys Cooper Signed To MGM Contract". Deseret News. 17 March 1945. Retrieved 27 February 2013. ^ "No. 44326". The London Gazette (Supplement). 2 June 1967. p. 6277. ^ England and Wales Marriage records; retrieved 31 January 2014. ^ England and Wales Birth and Marriage records; retrieved 31 January 2014. ^ England and Wales Birth and Death records; retrieved 31 January 2014. ^ Cooper, Gladys (1931). Gladys Cooper, by Herself. Hutchinson. ^ a b "Gladys Cooper, British Actress, Dies". The New York Times. 18 November 1971. Retrieved 25 September 2017. Without Veils, by Sewell Stokes, introduction by Somerset Maugham, Peter Davis, London (1953). Wikimedia Commons has media related to Gladys Cooper.